Italy may be best known as the home of some of the most exquisite architectural structures in the world as well as the birthplace of pasta and Leonardo da Vinci, yet the country also has a rich history of gambling, which can be traced back to the days of the Roman Empire. As a matter of fact, the origin of the word “casino” itself is Italian as it is the diminutive form of “casa” or “house”. What is more, the first ever gambling establishment in Europe, the Ridotto, opened doors on Italian soil to provide citizens of the lavish city of Venice with controlled gambling activities during the carnival season. It is anything but surprising Italy’s legislation in regard to online gambling is quite liberal as players from the country are allowed to legally place bets on the internet as long as the websites, they register at, bear the stamp of approval of the local government. Unlike players from some other countries, like Sweden and Finland, Italians are provided with a wider choice of licensed web-based casinos to choose from. Read on to learn more about Italy’s legal stance on online gambling and what the future holds for online casino players from the country. Until recently, all forms of interactive gambling that involve betting on games of chance (as opposed to games of skill) were considered illegal under the Italian legislation, sports betting being the only exception to this rule. The Italian authorities allowed only a few operators to offer such gambling services and these were all backed by the state itself, so the number of options for players from the country was rather limited. Thankfully for Italian gambling enthusiasts, this all changed in 2006, when the European Commission pressed the country’s government to introduce some amendments to its restrictive stance on online gambling. The Commission went as far as to conduct a special investigation into the regulations concerning the gambling industry in the country. This all led to the introduction of a new piece of legislation which aimed at regulating specific games of skill and opened the limited betting market to online sports betting providers that were based outside the territory of Italy. That being said, only operators that are based in countries with membership in the EU or are part of the European Free Trade Association are allowed to offer their services and products to Italian residents. The following years saw the regulation of more and more forms of interactive gambling. In 2007, games of skill, and poker, in particular, were legally offered over the internet to Italian players only in the form of tournaments. In the two years to follow, yet more changes were made as video poker and cash games were also permitted over the internet. It was not until 2010 that games of chance with fixed odds, such as craps and roulette, were added to the list of legal gambling forms Italian residents can partake in. The investigation conducted by the European Commission targeted the restrictive online gambling legislation of the country. In fact, the Italian government had gone as far as to prevent players from accessing the websites of online gambling providers that were based outside the country. The Italian authorities had no other option but to yield to the pressure of the European Commission which led to the introduction of favorable amendments to Italy’s rigid interactive gambling laws. In 2010, the country’s government finally gave the green light to foreign gambling operators allowing them to offer their services and products in Italy. The only condition the operators are required to meet is to receive a license from the local Italian regulator – Amministrazione Autonoma dei Monopoli di Stado (AAMS), which translates as Autonomous Administration of the State Monopolies. Currently, the number of operators to hold one such license exceeds one hundred, with Italian players being able to engage legally in a wide range of virtual casino games, including slots, video poker, keno games, roulette, blackjack, and poker. Another requirement is for the casino’s websites to utilize the .it domain for Italian players. Thus, when players visit the casinos from their native country, their IP address will be automatically detected as Italian and they will be transferred to the Italian version of the websites. All gambling activities in the country, both offline and online, are licensed and regulated by the aforementioned Autonomous Administration of the State Monopolies, which is located in the capital Rome. Only this entity has a say in which online gambling operators will receive an Italian license and which ones will be denied. Before the AAMS gives its stamp of approval to any foreign gambling operator, the latter needs to provide evidence that all requirements set forth by the regulatory entity are met in their entirety. This is achieved by providing various documents concerning the social, financial, and technical aspects of the operation of interactive gambling websites, based outside Italy. The operators’ websites need to be technically up to par, ensuring their service is secure, stable and user-friendly. In addition, virtual casinos should be based in countries that have acquired a membership in the European Union. Apart from that, various taxes should be paid by the operators but you will be able to read more on this in the section to follow. The amount casino operators pay in taxes varies depending on the type of gambling products they offer to Italian residents. The taxes for games of skill, such as poker, have a flat rate and are the lowest at 3%, while those for cash games are the highest at 20%. The gambling operators are also required to pay a 0.60% tax on their annual turnover from virtual casino games. Offering bingo games comes with a tax of 11.5%, while the taxes for providing sports betting and horse-race betting stand at 3.5% and 10%, respectively. Then again, the one-off fee operators are expected to contribute with for the license itself is set to €350,000. Please note that these are not permanent licenses, which is to say they need to be renewed every twelve months. Italian players, on the other hand, can have their peace of mind knowing that all winnings they have generated while betting online are theirs to keep in their entirety. No taxes are imposed on players’ profits. The licenses issued by the aforementioned entity cover a variety of interactive gambling products and services. These include games of skill like poker (including tournaments and cash games), virtual casino games like roulette, craps and blackjack, bingo, fixed-odds sports betting, and horse racing. Thanks to the introduction of the favorable laws regarding online gambling, Italy has become one of the most lucrative gaming markets in Europe. Unfortunately, not all forms of interactive gambling are doing equally well in the country. Online poker, in particular, has suffered a substantial decline as becomes evident by the fact its turnover fell by 10% as of 2016. The number of active poker players is reportedly also on the decline. 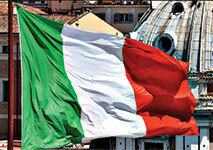 Despite the drop in online poker turnover, the future of online gambling in Italy is looking quite bright. The year of 2017 will see as many as 84 online gambling operators obtaining Italian licenses.